Kaathaadi means kite in Tamil. Don’t you think that the design looks like one? Thanks to my ammaji – For making this for me! It won't die.It will come in some other attire.This art indeed is alluring.All the rituals Indians follow have their religious charm on a scientific basis.Nice kiolam your Ammaji has designed for you. Thank you for sharing it here.I love all these items-Kolam,Rangoli,Pookkalam and so on. I love Kolams. I am still drawing them on the granite floor in front of our door in our flat...maakkolam, since it wont fly away or get erased by walking. I love Maa kolam too... 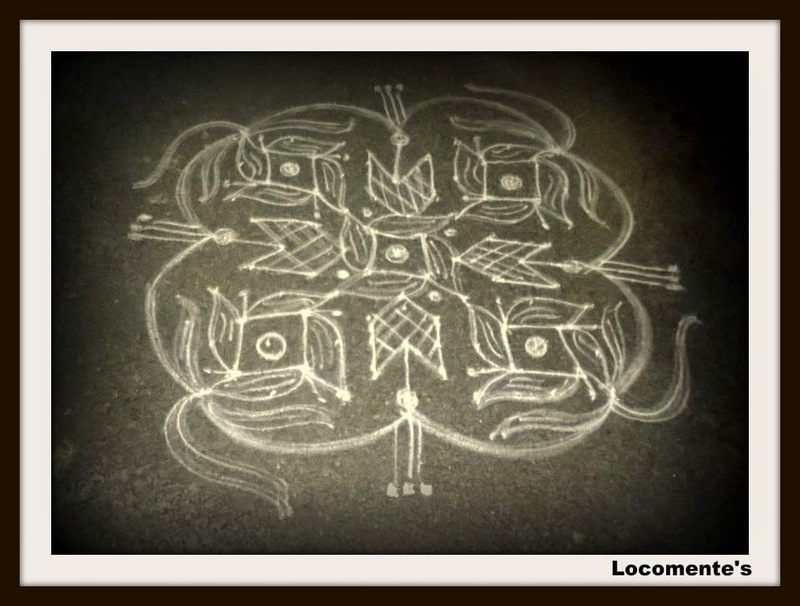 I am so happy that you still make kolam in spite of the space constraint! If you had not mentioned, I wouldn't have identified the kite in the Kolam. In a way that's good too, as the theme integrates with the design. I just named it as Kite kolam because it looked like that.